Women Who Kill is another indie film I would have never seen if, let alone heard about, if it wasn’t for the Spirit Awards. This is only a cool thing to say if I ended up liking the film, and so hey, good news, yay Spirit Awards! There are a lot of interesting things to say about the film, most of which I will say at the end, but probably one of the best aspects of the movie are how many women characters are in it. I would say there are only two guys who have speaking roles in the whole film that matter to the story in a slight amount. Basically this is a film directed, written by, produced by, and starring a woman, about women who like killer women. For those of you who like women a lot, you will probably like Women Who Kill. On the other hand, if you like women, maybe you don’t like them killing? Lesbians. Podcasters. Stereotypes. 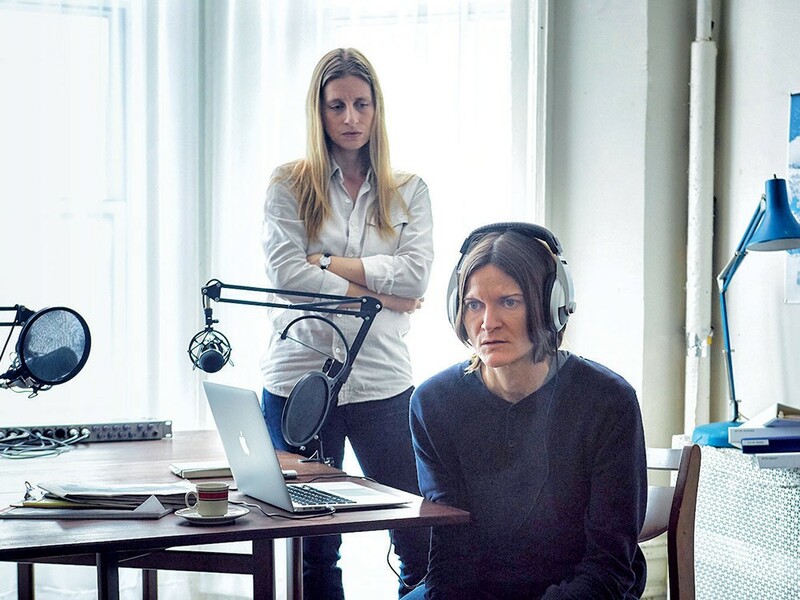 Morgan (Ingrid Jungermann) and Jean (Ann Carr) run a podcast show called, Women Who Kill. It is specifically about serial killers, who happen to be women, and that is it. Because Morgan and Jean are fascinated by serial killers, want to talk about them, want to go super in depth about them, and people love hearing about them. Unrealistically, they are sort of famous for this podcast and are recognized on the street by people who love their podcast. A rarity, given that podcast is rarely visual, but hey, lets run with this fantasy. Morgan and Jean used to be lovers, but ended it after sometime and still maintained their working relationship. Jean has moved on and is dating a man now, but Morgan is alone. Heck, another of Morgan’s exes is currently about to get married too. Everyone is happy. And then Morgan meets Simone (Sheila Vand). At the local farm/store co-op that Morgan works at (more stereotypes). She is hot and into Morgan, which is great. They hit it off, but still, Simone is a bit weird and it is hard to figure out why. That is, until Jean puts the idea in her head. Maybe Simone is a serial killer. Maybe she is the daughter of a serial killer and is continuing her mom’s path. And maybe she wants to kill Morgan, as an ultimate meta prize and is waiting for the opportunity to strike. Or it could all be coincidences! Also starring Annette O’Toole, Deborah Rush, Grace Rex, and Tami Sagher. On the third hand, if you like women, maybe you do like them kissing other women. Women Who Kill, early on, quickly found its stride with witty dialogue, funny moments, and likable different characters. It is fun to cheer for Morgan and Jean, making it harder to see their faults when they get to the points of real conflict. Simone’s character definitely stands out in the world they created, seemingly always shining (or the opposite of shine in some instances), just to pop out. Most of the surroundings just seem dreary, but not Simone, so her entity begs questioning and adds to the mysteriousness. I thought for sure I would end up loving this movie, but I thought the end started to unravel what started out as a fun clever story. It didn’t follow through too well, and honestly, sort of hated the ending. But Women Who Kill is a movie that definitely celebrates women. Of the two men roles, one of them is playing a role of house husband who adds nothing to the film and is practically ignored, which is a hilarious role reversal of a serious problem in movies. Still worth a watch, give these ladies some of your money.